LIVERMORE, Calif. — A Sandia National Laboratories-led team has demonstrated faster, more efficient ways to turn discarded plant matter into chemicals worth billions. The team's findings could help transform the economics of making fuels and other products from domestically grown renewable sources. Products made from converted lignin could subsidize biofuel production, making the cost of biofuels more competitive with petroleum. Unfortunately, lignin's toughness also makes it difficult to extract its valuable compounds. Scientists have wrestled for decades with deconstructing it. As a result, lignin often sits unused in giant piles. 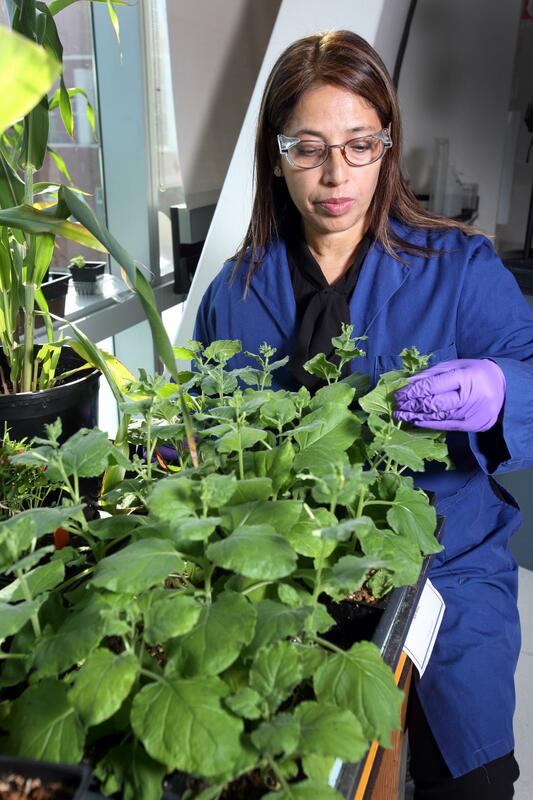 Sandia bioengineer Seema Singh and her team have demonstrated two new routes to lignin conversion that combine the advantages of earlier methods while minimizing their drawbacks. The team's recent findings are described in the journal Scientific Reports. "You get a little bit of whole lot of various chemicals when you break down lignin this way," explained Singh. "The quantities yielded are not terribly useful." Her team has demonstrated two new techniques that incorporate the speed of a chemical method and the precision of a biological one. In both cases, Singh's team ultimately produced high-value chemicals that currently are derived only from petroleum: muconic acid and pyrogallol. Muconic acid can easily be turned into nylon, plastics, resins or lubricants, and pyrogallol has anti-cancer applications. Together, Singh reports these chemicals have a combined market value of $255.7 billion. "Muconic acid is what we call a platform chemical. From there, creating new products is really just a matter of imagination," she said. The team's first new conversion method is a multi-stage process that begins by pre-treating lignin with a weak solution of hydrogen peroxide and water. Intermediary molecules vanillin and syringate result from the treatment. The second method skips the process of having to break down the lignin altogether. Instead, the team genetically engineered a tobacco plant. As it grows, the plant produces high amounts of intermediate compound protocatechuate. Then, the only steps remaining were to extract that PCA and use the engineered E. coli to make the muconic acid. "We basically skipped three quarters of the steps we were doing previously by engineering the plant to grow intermediate chemicals," Singh enthused. "PCA can be easily extracted from the modified tobacco and converted into muconic acid with little effort." This plant engineering route is not only more efficient, but it also successfully solves the team's self-imposed challenge of maximizing muconic acid yield by as much as 34 percent over previous conversion methods. Sandia funded the majority of the work on this project through its Laboratory Directed Research and Development program. The tobacco plant engineering work was done by Singh's collaborators from the feedstock division at the Joint BioEnergy Institute in Emeryville, Calif., including Dominique Loque and Aymerick Eudes. Singh directs the biomass pretreatment program at the institute, which is staffed by scientists from a consortium of laboratories including Lawrence Berkeley National Laboratory. She believes future research into increasing lignin's economic value will be heavily influenced by her team's demonstrations. The biggest challenge in this field will be further maximizing the yield of valuable chemicals, and the rate at which they can be yielded. "Everyone understands that hybrid approaches are key to lignin valorization," Singh said. Industrial adoption of this technology will depend on the ability to quickly produce large amounts of high-value product. "If you can only make milligram amounts in a month from a bug, that just won't cut it," Singh said. "You want the organisms to make kilogram amounts in less than an hour, ideally."